It wants to have two subroutines when it grows up. This is my favorite ICE. I've been playing NBN since shortly after Core, back before it got any good. I was splashing Ice Wall, just because it was a 1-credit ICE that ended the run. Even though Barriers are the easiest and least expensive ICE to break, it was still worth it to keep them out for a few turns until they got a Corroder out. And then this beauty came along. Now, for one credit, and more importantly, 0 influence... I can get a run-ending ICE. Not only that, it's a Code Gate. Decoders like Gordian Blade cost twice as much as Corroder to play, and that's a bigger deal than you might think, in the early game. Sure, there are other Decoders, but none without some kind of downside. 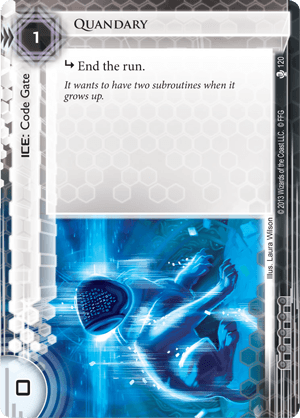 At the end of the day, Code Gates are just straight-up harder to break than Barriers, especially in the early game. And the 0 strength? Who cares? Unless a Code Gate has a strength of 3 or more, Gordian is going to break it for one credit anyway. Some people will still argue for Enigma, the closest comparison to this card. Yes, the first time they hit it, Enigma will probably drain a click. And yes, if they're running on any click except for the last one, it will cost 2 credits instead of 1 to break with Gordian. Is that worth two extra credits to rez? Not even a little bit. Not to me, anyway. Cheap ICE will hold them off for a few turns while you build things up. It's easier to make money if you already have money (Restructure is the perfect example of this) so if you're not wasting two extra credits on keeping them out in the early turns, you're two credits closer to reaching the "filthy rich" stage of the game, which isn't as far away as you think. All in all, as I said before, this is my favorite ICE. It has been a 3-of in every corp deck I've built since it came out, and that isn't likely to change. The trick to Quandary's efficiency is subtle, but clever. To discover it, go do a search for 0-strength Decoders. You'll find only three. Study Guide, which pays up-front so that it can receive permanent boosts. Sage, which pays up-front for additional power conditional on unused MU. And Crowbar, which is both temporary and never actually 0 strength in practice. In all these cases, the "basic" 0-strength Decoder is made more expensive to pay for the ability to make it permanently more powerful. What this means is that if you use Quandary, the Runner is paying for base strength or permanent growth potential on their Decoder that they do not need. This is a subtle drain on their resources. It's a similar story for the new Vanilla.